I think it must have been in the late sixties, early seventies that Norval Morrisseau saw a rock painting not far from the mother' land of my ex partner Simone McLeod; it inspired him and he made his own version of the painting. The old rock drawing is located along a rough, shortcut canoe route from Lac Seul to Lake Winnepeg, along the Bloodvein River drainage. 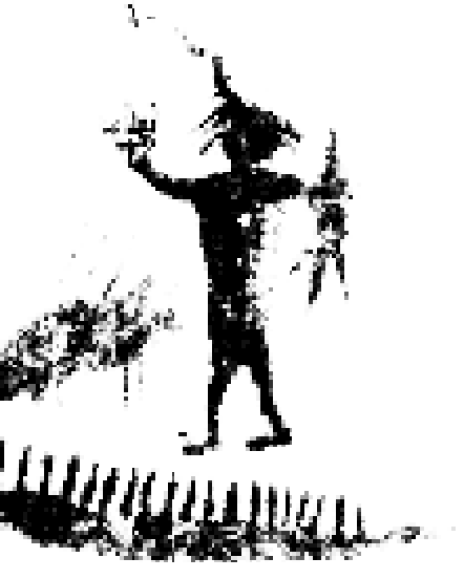 It was a spirit writing, I guess what nowadays would be called a pictograph, presumably representing a Midewiwin Sky Man holding in his left hand an otter bag. From the head of the Mide figure are painted lines directed to the Sky Grandfathers with the shape of lightning. The Mide otter bag roughly has the same shape as two images that Simone pictured in her mind, and then on a piece of paper, in spring 2013 as she was roaming amid lakes and Grandfather rocks. This was two days before I had the dream. In the dream I saw a man who looked like Morrisseau. I recognized his face profile as belonging to him. He looked sideways to the left and he was grinning as he painted this Sky Man image on the cliff wall. I thought it was funny that he wore my leather sun-eagle vest, I think I was smiling in the dream. Then I woke up, still smiling.